If you’re craving for a new look but can’t seem to find the perfect hairstyle, don’t fret. We’ve got you covered with this amazing hairstyle guide! I think one of the many mistakes women make is to blindly follow what’s trendy even if it doesn’t suit them. Our bodies vary in shape and height. Your friend may be able to pull off a retro look, but when you try it, you look like just another poser trying to rock a style that’s not suited for you! This is true with hairstyles as well. Wear the wrong hairstyle, and you’ll look like a walking-talking mess. But how do you know which hairstyle suits you best? Refer to this handy hairstyle guide! This hairstyle guide courtesy of therighthairstyles.com will definitely make choosing the right hair for your face shape easy and convenient! I’ll also make it even easier for you by giving you a general idea of how to pick your hairstyle (in case you prefer something else other than what’s provided in this infographic) as well as celebrities that match your face shape (because we need people to look up to, right? *wink*). 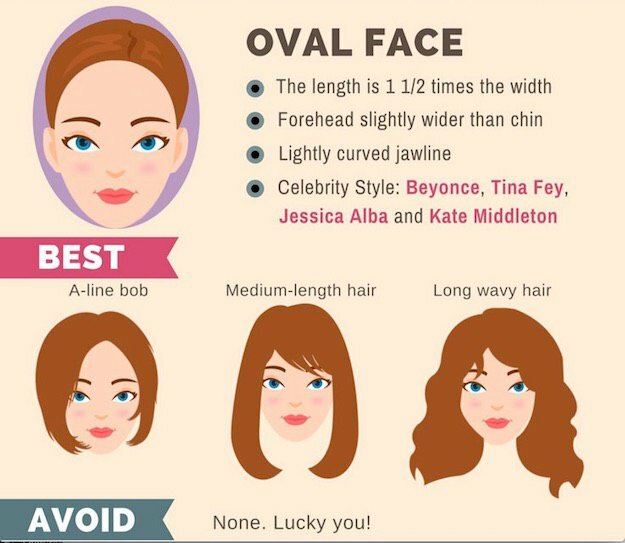 Do you have an oval face? Then consider yourself lucky. 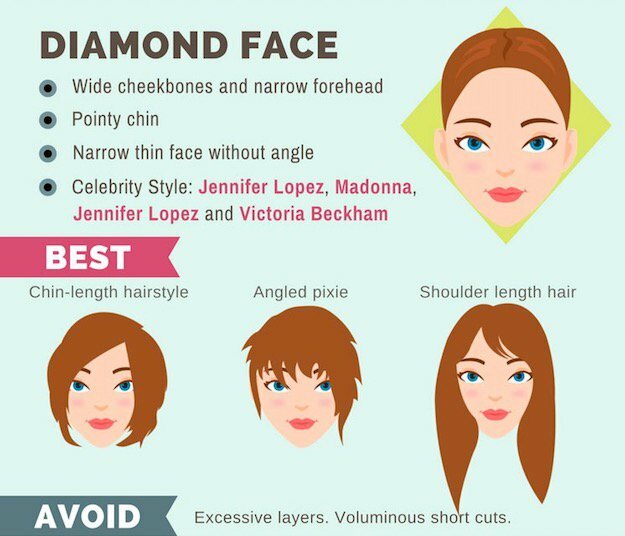 You tend to have some features of all the other face shapes (e.g., rounded jawline, which you find among women with a round face), so almost any type of hairstyle works for you. You have every right to be adventurous with your look! While round faces are cute, they tend to lack one important face element: structure. Since the length and width of the face are equal, there’s no angle. Thus, this hairstyle guide points you to styles that create the illusion of structure such as waves, parting hair, and layers. In the meantime, avoid hairstyles that follow or frame your face’s round shape. This one is quite the opposite of the round face since the angles are strong. The chin and the jawline are defined. What you need are hairstyles that can help soften the look and the illusion of some roundness around the cheeks. In the meantime, avoid hairstyles that reveal your jawline and chin. When it comes to the best hairstyle, you want one that breaks the length of your face, so to speak, and creates width, which explains why curls work best for you. Avoid wearing your hair very long. A distinctive feature of women with a heart-shaped face is the pointy chin, so you want to pick hairstyles that draw the eyes away from that area. You can also soften the strong angles around the chin area by opting for waves and layers. The diamond face is actually considered the rarest among all face shapes, and it sometimes looks like the heart shape because of the pointed chin. The main difference? The cheekbones are wide. For this face shape soft, side-swept bangs are great since they help hide your narrow forehead while lobs and hairstyles that fall straight to the side of your face help emphasize the jaw and chin and “camouflage” your cheekbones. Isn’t this hairstyle guide amazing? I know it will make your life easier. Remember, the right hairstyle highlights your best assets so choose well. Show off how amazing your new look is with our #Flawless shirt, get it for FREE. Did this hairstyle guide help you? Share your thoughts in the Comments section below! Meanwhile, beat the frizziness with this simple but effective technique. Can you have combined face shape? I was told I have oval shape, but my jaw has a round-squareness to it, so I guess i got wide squoval face if that makes sense. I look good in long braid down the back, ponytail, pin a flower to one side, put hair in bun, loose messy chic hair twirled up in claw clip, baseball cap. I got to the beat of my own drum and not follow the “IT” of the moment styles. I trim my own hair to save money since my budget is tight.